West Ham's new Portuguese signing Joao Mario opens up about having to adapt quickly to the Premier League after his January move from Inter Milan. He also reveals he finds boss David Moyes accent difficult to understand! West Ham`s new Portuguese signing Joao Mario opens up about having to adapt quickly to the Premier League after his January move from Inter Milan. He also reveals he finds boss David Moyes accent difficult to understand! Joao Mario has revealed the persuasive powers of compatriot Jose Fonte convinced him to move to West Ham. The Hammers secured the services on the Inter Milan midfielder on loan until the end of the season on January 26 - one of only two signings made in the winter window. And, speaking exclusively to Sky Sports, Mario explained how Fonte contributed to his decision to trade Serie A for the Premier League. I knew West Ham were a big club with a lot of history so it was easy to come, he told Soccer Saturday. It was great because also here at West Ham is Jose Fonte, who plays with me for the national team. That`s made it easier. He said good things and tried to convince me all of the time. He told me to come to the best league, a great club and enjoy. That helped a lot so I came to see for myself. 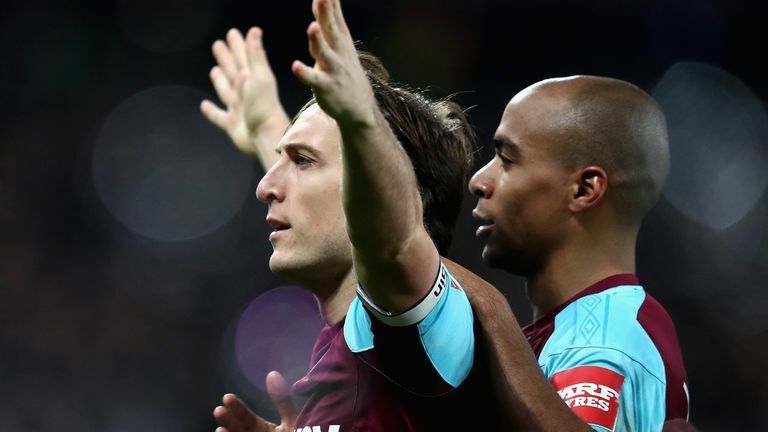 Mario and Fonte were team-mates in Portugal`s Euro 2016 winning squad and the pair will no doubt be keen to replicate that success as West Ham battle against relegation. Beyond the Premier League campaign, Mario has his sights set on representing his country at this summer`s World Cup. And the Portuguese believes guiding the Hammers to safety can secure his spot on the plane to Russia. It`s a World Cup year so I need to be fit and playing to be in the squad, that`s the main reason I left Inter, Mario added. I also want to help West Ham and help myself with this experience in the Premier League. It`s so competitive here, I was used to a different league, different football. In Italy everything is tactical but the game is so slow. Here it`s fast and physical. We need to be ready for all the scenarios. We don`t think about relegation, we need to think higher. The most important thing is the next game on Saturday against a team that are in the same situation. We need to think about ourselves and win the game. Catch the full interview with Joao Mario on Soccer Saturday from midday on Sky Sports News.